Giovanni Malito: Syllabic Poetry, Revival of the Sedoka via the Sijo? I barely understood what haiku is until I read The Art of Haiku 2000 by Gerald England. This book has become my reference book for haiku and other forms of Japanese poetry such as senryu, tanka and haibun.I urge any person who wants to understand haiku to buy The Art of Haiku, mark it with notes thoroughly and use it constantly for reference. Meeyauw (Andrée). This is a great little book, a must for anyone interested in reading and writing haiku and related forms of poetry such as tanka and senryu. It includes articles on different aspects of haiku – including the concept of sabi, the inexpressible element of the content of haiku. Also covered are the difficulties of translating Japanese language haiku into English and the differences in the form in the two languages. There are articles on tanka, haibun and scifaiku (science fiction haiku). In addition there is an excellent selection of haiku, tanka and haibun, to showcase some of the best examples of each form. Crafty Green Poet (Juliet Wilson). 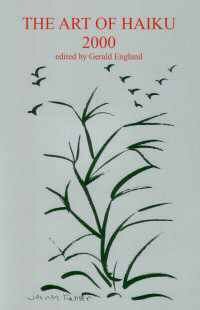 If you've ever been interested in haiku, what are they, where they came from, how to write one, or you want to read some, then this is the publication for you! Not just haiku either, but senryu, tanka, haibun, renga, sedoka, sijo, and related genres! All explained, with lots of examples. A highly impressive publication. Zine on a Floppy (Andy Savage). Gerald England reminds us that a haiku is essentially the distillation of a moment. Haiku are set in nature (in the widest possible sense) and they reflect the human response to nature. Often this is by the juxtaposition of images. I think every poet imagines they can suss out and gatecrash haiku but one glance at the many articles and examples that make up this study will soon have you reassessing your efforts. Minimalism and brevity is one thing, but here we are led by example behind the surface and symbol of a few simple lines to an element of surprise that imprints itself on the reader so it's not too soon forgotten. ....An interesting read that still makes me want to dabble. The Affectionate Punch (Andrew Tutty). .. the idea is rather than take the reader through a heavy, learned discussion, the book [takes] them on a journey of discovery so that they arrive at the end of that journey having imbibed the essence of haiku and related forms almost unknowingly. ... This is a good book for anyone who wants an enjoyable introduction to haiku and related forms and there is enough in it that is different to interest any of us that may feel we've already been there and wear the tee-shirt. Journal of the British Haiku Society (Frank Dullaghan). Extremely useful to those who are utterly bewildered by the numerous experts on the Haiku and who really fret about the supposed mysteries of this elusive Oriental verse form. The book succeeded in reinforcing my notion that the Haiku has become unnecessarily overburdened with critical complexity and disproportionately overblown to the point of tedium by entrenched experts. I often wonder why Haikuists bother to devote the time (or the worry) to having a serious go at finding the correct form, but with the help of Gerald's highly detailed historical pointers and his brave attempt to untangle the mess that western experts have made of a relatively simple poetic form, it may even be possible to gain some sort of an opinion of your own. If the subject does worry you and you want to get in on critical Haiku infighting then this book is the one for you because of its excellent thoroughness - though at the end of the last chapter - a beautiful seventeen syllable suicide note rather than a successful Haiku is a distinct possibility. Poetry Monthly (Martin Holroyd). Many fascinating articles, much good poetry. Handshake (John Francis Haines). most valuable are the very many poems in the various genres by renowned poets from around the world. To read these new poems with a mind open and uncluttered sets one's feet on the path of perception and understanding of the soul and spirit of the various forms. Time Haiku (Dan Pugh). A no-nonsense introduction to the obsessive joy, nay a life-philosophy, to be gained from attempting haiku, tanka or haibun. Jampacked with excellent advice from various authors. Recommended reading for anyone interested in contemporary poetry. The Journal (Sam Smith). you'll find real gems in The Art of Haiku, foremost amongst which is the article on HAIKU AND SCIENCE EDUCATION. Enlightenment and understanding come most often from shifting your paradigm, exchanging the model you habitually work with for something completely different; here is an account of all-age students writing haiku within the context of "science" classes, using a scientific approach—close observation from immersion in Nature, precise data gathering using the five senses, careful distinguishing between observation and inference, clear & concise expression. Haiku writer as scientist! How does that feel? Presence (Colin Blundell). Although its very success at integration tends to hide this fact, this book is also another excellent example of Gerald England's editorial art and judgment. Pennine Platform (K.E. Smith). Appropriately, the book cover has been drawn by one of the authors: the illustration a statement of haiku growth reaching transient moments of Zen. This highly commendable book is well worth its price tag, be it for pleasure or learning. iota (Peter Huggins). This is an impressively produced paperback, and is thoughtfully laid out with poetry, images and explanations of various forms. Particularly interesting is the early 17th Century work produced here. Peace and Freedom (Paul Rance). Any book which seeks to increase understanding and appreciation of the genre is welcome, and the essays here cannot fail to assist the process. Manifold (Bob Newman).